ROCKINGHAM Detectives claim a man swung a golf club at a staff member and stole alcohol from a Port Kennedy shop on Tuesday, May 3. 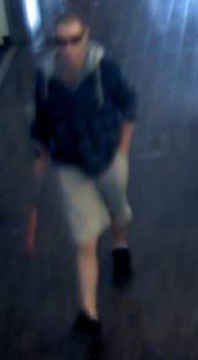 Police said the man, pictured, entered a supermarket in the shopping centre on Warnbro Sound Avenue at 12.30pm. He selected an amount of alcohol from the shelf and walked from the store. Police said he was spoken to by a staff member and alleged the man tapped the golf club on the counter and continued to walk out of the store without paying for the alcohol. It is alleged the man swung the golf club at another staff member who had followed him from the store. The man left the area with the alcohol. He was described as about 30 years of age, about 183cm tall, of slim build, with very short cropped blonde hair and a Southern Cross tattoo on his lower left leg. He was wearing a black and blue checked zip-up jumper with a grey hood, grey or beige knee-length shorts and black runners. Police would like to speak to anyone who may have seen the incident or who can identify the man. Call Crime Stoppers on 1800 333 000.